Wine Club Orders - A bulk order feature enabling wineries to create and efficiently manage wine club shipments (wine club best practices). Wine Club Members - Wine Club Members can log in anytime to change their preferred shipping address and credit card. Wine Club Sign-Up - Capture new wine club sign-ups online. Easy To Use Product Entry - No HTML or design experience necessary! Upload professional product pages to your site in a just matter of minutes. Discounting Structures - A flexible pricing structure to accommodate mixed case and wine club member discounts. Allocation Tools - An allocation tool to limit wine purchases by customer type if needed. Inventory Control - Built in inventory control tools to prevent over-selling of wines. Order History - Customer order history is stored and searchable. Custom Logins - Optional password protected access to online store/wines for specific customer types. Customer Types - Unlimited customer tiers/types for preferred pricing and/or product allocation purposes. Import Customer Records - Existing customer data import capabilities. Update Notifications - Automatic email notifications to winery when a customer updates their profile online. FedEx & UPS Automation - Integrated shipping tools with FedEx, and UPS enabling wineries to print shipping labels directly from the Nexternal Order Management System along with "Adult Signature Required" on the label, as well as pull tracking numbers which are sent to customers for their records. Credit Card Processing - Integration with major payment gateways enabling efficient online credit card processing. Batch Processing - Batch process all outstanding orders at once (credit cards and shipping labels). Email Marketing Tools - Integrated email marketing tool enabling wineries to communicate and announce new releases or special promotions to their customers to encourage online shopping. Social Networking - Nexternal's post order sharing feature makes it easy for wine buyers to post their latest purchases on both Facebook and Twitter. 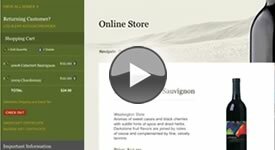 Search Engine Friendly - Nexternal's latest storefront software, Nexternal.NET is designed from the ground up to be search engine friendly, helping rank the winery's online store high in the search engines driving qualified traffic to a winery's website for those searching for their specific wines. Snooth & Wine Searcher - Product data from a Nexternal online store is picked up and indexed daily by Wine-Searcher.com and Snooth.com. Promotions - Flexible coupon feature allows for creative marketing campaigns. Shipping Restrictions - Shipping restriction tool enabling wineries to control which states they will and will not ship wine to, allowing them to comply with legal issues. Volume Limits - Wineries can specify limits on the amount of wine shipped to customers in states that impose volume restrictions. Age Verification - Integration with IDology to ensure customers are at least 21 years of age. Merchants can also use a legal disclaimer feature forcing customers to agree that the person receiving shipment is at least 21 years of age at the time of order submission. Sales Tax Reporting - Wineries are able to charge sales tax down to the lowest level jurisdiction for states that require it. ShipCompliant Integration - The ShipCompliant web interface makes it easy to pull order data directly into ShipCompliant. This is ideal for compliance reporting purposes. Wineries using both systems can also "push" data to ShipCompliant for real time compliance checks at the time the order is placed. Always On-Screen Shopping Cart - An always on screen shopping cart is easy to use from a customer perspective ensuring a high visitor to customer conversion rate resulting in higher sales revenues. Integrations - Several third party wine companies have built applications that interface with Nexternal including ShipCompliant, AMS, New Vine Logistics, Vintage Logistics, and Bacchus Distribution. Nexternal also offers an XML toolset that can be used to integrate with other systems. QuickBooks - QuickBooks export capabilities eliminating manual data transfer. Experience - More than 10 years experience working in the wine industry, resulting in a clear understanding of the complexities of selling wine online. Gift Cards - Gift cards which may be redeemed in the online store or offline in a tasting room. If you are interested in learning more about how your winery can utilize Nexternal's award winning shopping cart software to sell wine online, please call 800-914-6161 ext 228. We would be more than happy to talk you through our online demonstration located at www.surfsidecellars.com. Please also read our winery testimonials.